Whew, that was close. I almost fell off the face of the earth there! This Memorial Day weekend was a bit busier and longer than expected, not that I am complaining. Because of that I have so much to share with you! Saturday is really when our weekend kicked into gear. This was mostly brought on by my insanity and desire for a new to us dresser for our guest bedroom. You know...the one I want to paint green. Well after some Craigslist searching I found a good deal on 6 pieces of knockoffs that looked like the replicas of Campaign furniture. The pieces are by no means the good quality replicas, but they are perfect for us with the moving and such. After making contact with the guy we got a rental truck and went on our way. Thank the Buddha that Nate loves me so much and my crazy whims...especially right before we move. They are now sitting in our garage waiting for our move. I even promised Nate that I wouldn't even think about painting them till we got to our new place. This is of course a brilliant idea because that means the new paint job won't get messed up with moving and it gives me one less thing to worry about in these next two (now less than two) months. I promise that I will have pictures of them posted this week! Now to sell our old dresser before we move. Anyone want a dresser? Monday was spend eating BBQ at our local and very yummy Memphis BBQ restaurant Whole Hog Cafe. If you're in the area...go and try it. NOW! We also decided to finally head to the National Museum of Nuclear Science and History (long enough name for you?). I'm planning on doing an actual post on this...so you'll have to deal with one picture. Somehow we also ended up at the mall and Target. We're gluttons for punishment when it comes to going places on a busy holiday. Though I won't complain too much because I got some goodies. 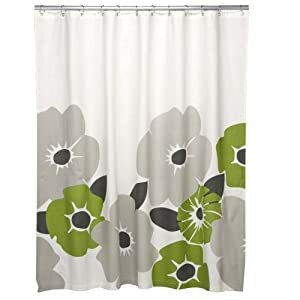 We also snagged a new shower curtain, because we will most likely have two bathrooms with shower/tub combos. This will be packed with us...so that we can be sure to have a way to shower if we get into the house before our stuff comes. Yay smart ideas! I grabbed the Havana Nights nail polish sampler from Sephora. I heard some people aren't liking the formula, but I want to try it for myself. I will have a review of the colors soon! Banana Republic...which I haven't been to in ages for many reasons. Again they really had nothing I liked. I'm hoping that sooner or later they will get back on track with having some unique pieces again. I did dig through the sale shoes and find those beauties. They were $30.97 and I got an additional 25% off ($120 full price)! Score! I have no shoes like these...shocking I know. At Target we picked up DwellStudio for Target Pansy shower curtain. I've loved it for some time, but was trying to stay away from green when I redid the guest bathroom. Upon hearing that we would have another shower that would need a curtain I decided to grab it. It will be perfect for our bathroom because we already have green in there, plus the gray will pull from the gray in our bedroom! Yesterday was spent getting a sunburn...I mean car shopping. Don't you worry my dears, we're both very happy with our two cars. I went as moral support, with a side of sarcasm, for my friend. She ended up leaving the lot with a pretty stinking awesome Ford F-150.Now this is rather shocking to have me say, because I am a European car girl through and through...the F-150 is a damn nice truck. Like wow. Good job Ford. And that will probably be the last time you ever hear me say anything even remotely nice about American cars. Well there is my longer than normal holiday weekend. It was nice to be able to do some fun things, which really helped me take my mind off of this move. I hope everyone had a wonderful holiday weekend and I look forward to getting back into the swing of things! Did you get anything good with all of the sales that were going on? Did you do anything for the long weekend? I read a book over the weekend, thats about it. Kept it low key ;) Oh, I can't wait to see the Campaign replicas! Haven't been able to score any off Craigslist over here. Lucky girl you! Congrats on the craigs list find! I am hunting for a specific sized dresser for our bedroom. Every time I find one, someone snags it first. grr..
Oh, those shoes ... those cute shoes! Great deal!!! We actually did some furniture shopping Friday evening. Finally found the deal we wanted on new furniture for our family room and it was on sale for Memorial weekend. Already had the old - but still serviceable - set picked up by Salvation Army. I spent Saturday in a scrapbooking workshop with my daughter which was so much fun. Had some family over Sunday for a BBQ and vegged out on Monday. Nice weekend. I was happy to find them...even though they aren't the "really nice ones". I will get pictures up soon! Thanks and I feel your pain! I have been looking for dressers forever, and I know I will keep looking (just in case), because I can't help myself. Good luck and I hope you find something! I too was excited about those shoes and the price? Heck yeah! I'm so glad you found stuff for your living room. I know prices can be insane, so yay for deals!